A luxurious yet simple DIY body scrub that’s kind to all, including the sea. It’s that time of year when we search for the perfect gifts to show others our love and appreciation! Friends, neighbors, teachers, co-workers, and all sorts of wonderful people in our lives can make for a list that can get quite out of hand. So how do we spread cheer and the spirit of the holiday season while keeping it simple and budget friendly? Well, I have a simply sweet homemade solution that might be the perfect inexpensive Christmas (or birthday!) cheer for many of those on your list. Not only that, it’s a gift that’s kind to the sea too, so you can feel good about giving it! It’s a body scrub that is a treat for the senses and will leave your skin feeling soft and glowing. It’s simple to make, with just 3 ingredients. You can make several jars assembly-line style in one sitting, and happily cross off many from your list. Giving a sea salt scrub like this one can actually make a positive impact on our oceans, our lifeline to a healthy world. How!? Well, many of the scrubs, body washes, and facial cleansers (even toothpastes!) these days have tiny plastic beads in them. These “microbeads” are so tiny that after they’ve been washed down the drain, they eventually end up in the ocean. What’s really scary is that sea creatures mistake them for food, which causes the plastic’s toxins to be transferred up the food web, including us as fish eaters. Pretty crazy that we’re putting plastic pieces in products that are supposed to care for our well being! The beads can even be hidden, with the word “microbead” no where to be found on the package. Check your bath products and toothpastes for polyethylene and polypropylene on the ingredient list. If it doesn’t have either one of those, then your products are free of microbeads! If you’re like me and this knowledge has you re-thinking your skin care routine, look for products with natural exfoliants, like walnut shell powder and jojoba beads. Having to re-think my skin (and tooth!) care routine, if it means a healthier world, is a price I’m willing to pay despite the bother of changing products. Here’s a list of the Top 11 Microbead-Free Exfoliants from Allure to get you started. No matter if you live near the ocean or far inland, you can have a positive impact on our oceans simply by switching to products without microbeads and giving a microbead-free body scrub like this one. Be sure to use these printable gift tags so that others can be in the know and make a positive impact too by nixing the microbeads! How much better can you get: a ridiculously easy and stress-free handmade gift that is a luxurious treat for the lucky receiver, and can help our oceans too. Scroll down for the recipe, cost estimate, and use instructions. So, enjoy gift-giving this year, and keep it simple. Focus on the true spirit of the holidays, and the joy that comes with giving. Rinse the jars first, then add sea salt, followed by oil and essential oils if desired. Mix with a spoon and top with the lid. 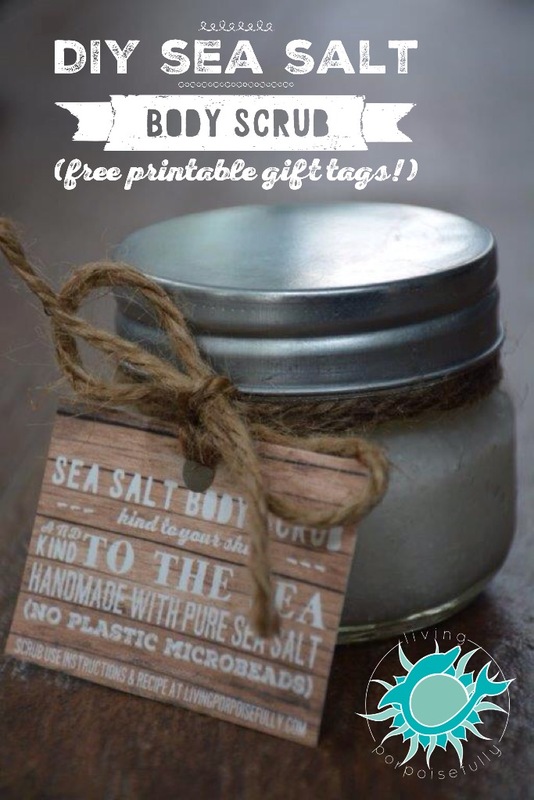 To add an easy and pretty touch for gift giving (and to bring to light that it doesn’t have microbeads), print my free gift tags on card stock, cut them out, hole punch in the center and tie to the jar with twine. So sweet and simple! Eighteen luxurious gifts came out to be about $4.36 each, far less than what you would pay for the same quality in a body store! Be sure to inhale the wonderful scent of the essential oils, if you used them. There’s no need to moisturize after rinsing, since the oil will nourish your skin. Store in a safe place outside of the shower. Enjoy!